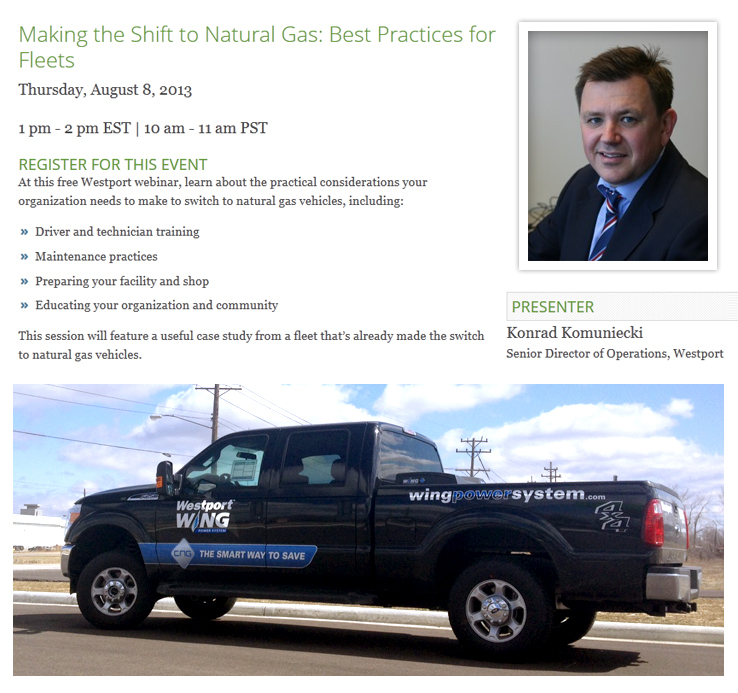 Westport is offering a free webinar on August 8: Making the Shift to Natural Gas: Best Practices for Fleets. We sat down with presenter Konrad Komuniecki, Westport’s Senior Director of Operations, and chatted about the topics he’ll be covering during his presentation. Q. Why are we talking about this topic? A. Once you’ve made the choice to switch to natural gas, it’s important to understand what you need to do to adjust your operation. We’ll provide answers and information to attendees about the practical considerations involved in switching your fleet to natural gas. Q. What’s the value to potential fleets? A. The presentation will help fleet owners and managers understand the process they need to take when preparing their facilities and operations for natural gas vehicles. Understanding what kinds of preparation and alternations are needed will help fleets make the rights choices to ensure a successful transition to natural gas. It will also be a good opportunity to hear about the resources available for fleets who’ve made the decision to switch. We‘ll be providing the names of websites, key literature, and contacts. Q. Who will benefit from this? A. Fleets who are thinking about natural gas vehicles, and also those who’ve made the decision to run on natural gas but need help with the transition. We’ll address the key operational changes needed for natural gas vehicle operations, including a very important topic: safety. Q. Why are things like staff and driver training so important? A. For many drivers and staff, natural gas will be a relatively new fuel. It’s important that they understand the business decision to switch to natural gas, the advantages to the company and operations, and the safety precautions their organization is putting in place for everyone’s protection. A. Anyone who is interested in learning more about how to transition their fleet to natural gas. Specifically: Fleet and operations managers, maintenance personnel, drivers and dispatchers, health and safety personnel.